The hippie costume is easy to do at home and doesn't require purchasing a lot extras. Many kids and adults love using this colorful costume idea for Halloween. 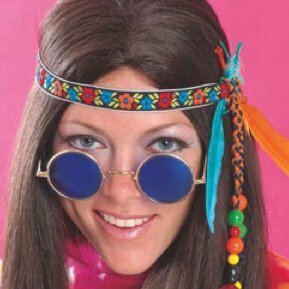 This is a guide about making a hippie costume. 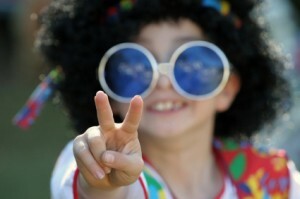 My son is 10 years old, and for spirit week at school they will be having a "Hippy Day". Any suggestions on how he could dress for this would be great. Tie dye bandana around his head, tie dye teeshirt, oversized or a peace sign on his shirt. Everything bright psychodelic colors. A peace sign necklace, leather bracelet or watch band, flip flops, or worn out sneekers, or some of the Converse type sneekers, from the old days. I suggest going to goodwill for some of the items, so you don't ruin anything that he already owns. Jeans, similar to what is worn these days, torn out knees. But hippies always seemed to have jeans that were too long and worn out around the bottoms from dragging the ground. A macrama belt, or no belt at all. Patches on the jeans, flower power type things was what I wore, but for the guys, peace signs and rainbows, vivid colors all the way. Probably get a regular shirt put a peace sign on it and then a vest over it. Them some patched pants would look awesome. 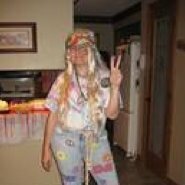 With instructions for bell bottom jeans and more this site has great information about making your homemade hippie Halloween costume. 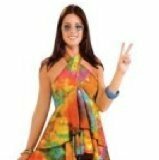 Here is a site with some simple ideas to help put the finishing touches on a hippie Halloween costume. This site has some great idea to help accessorize your hippie costume this Halloween.